Namco Classic Collection Volume 1 is a compilation arcade game that was released by Namco in 1995. 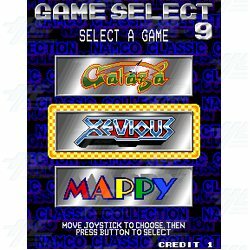 It is a collection of three popular Namco games - Galaga (1981), Xevious (1982) and Mappy (1983). In addition to the original games, there are "arrangement" versions that include 2-player simultaneous play, additional enemies, updated graphics and music. In addition the game Super Xevious (1984) is selectable as well.